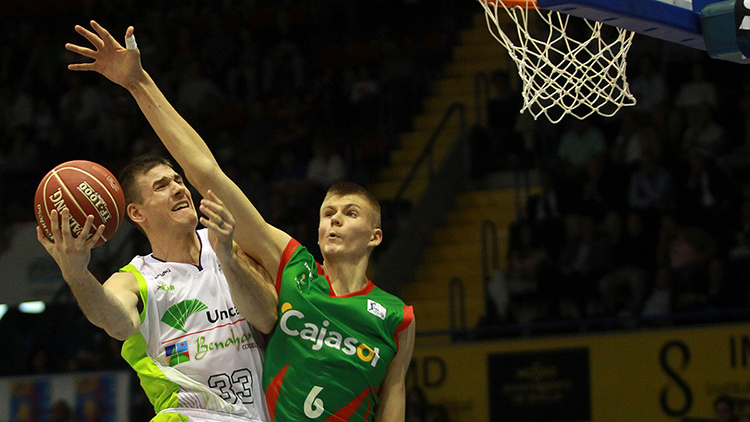 » Who Is Kristaps Porzingis? The above video is the first episode in a three-part series that follows relatively unknown Latvian prospect Kristaps Porzingis as he prepares to be a lottery pick in the NBA draft. Kristaps Porzingis looks like a bust. Just look at him. He looks like hand-pulled noodles, like an emaciated Dolph Lundgren as Drago. Good old Dolph never got to be much more than Drago, and from first glance, it’s unclear if Porzingis will be much more than what he appears to be: a bust. Thank god teams don’t draft players based on first glances. Right? Porzingis’s body is a cliché. It is as long as the list of preconceived notions it has come to represent. His body is a manifestation of that anxiety warning us that history is going to repeat itself — and no one ever says “history repeats itself” and means it in a good way. This is the Manic Pixie European Draft Prospect your cynical sports fan friend told you about. You watch the highlights and it’s hard not to like what you see. But then it happens. The ghosts of Nikoloz Tskitishvili, Darko Milicic, and Jan Vesely join hands and form a flat circle before you. They whisper in your ear: Zinger’s next. Athletes will tell you that their bodies are their business. So how is business going for Porzingis? Very well, turns out. Young Kristaps (and he is very young, at 19) has some of the chief draft influencers in the media singing his praises. Chad Ford, in a recent SportsNation chat, mentioned that he’d heard rumblings that the Lakers are taking stock of him as a possible pick at no. 2; the Knicks are intrigued, too. Smokescreen or not, you don’t get that kind of attention if there isn’t real potential. Needless to say, those two fan bases, starved for a panacea, have been driven crazy to think that some skinny kid from Latvia is meant to be their savior. All draft picks are crapshoots, but some feel like crappier shots than others. It’s uncouth to plainly say, “I have a bad feeling about this guy,” so we do our best to justify our vague inklings. The stronger our distaste, the stronger our effort. So of course it’s the foreigner with the spindly frame and the funny name who has people, if not intentionally, grasping at long-discredited forms of human categorization. Dig into the Porzingis analysis out there and you might come across the word “ectomorph” on more than one occasion. What a gross word to say. It means he’s built to be a thin, frail, and passive loner. It’s one of three somatotypes, body descriptions that make up a classification system based on a 70-year-old pseudoscience that sought to establish a physical and intellectual hierarchy among humans. So, yeah, it’s super gross and ridiculous and … fitting? After all, what is the draft if not the modern (and culturally acceptable) phrenological exhibition? What is the draft if not complete pseudoscience? Let’s back up. Kristaps Porzingis is a 7-foot-1 power forward who plays for Baloncesto Sevilla, which competes in Liga ACB, widely regarded as the second-best basketball league in the world. He started more than half of his games this season for Sevilla, averaging 11 points, nearly five rebounds, and one block in 21 minutes, good enough to be named the 2014-15 Eurocup Rising Star. His bona fides are legit, arguably more so than most of his draft peers, considering the level of competition. Despite their physical similarities, Porzingis isn’t quite the athletic anomaly Andrei Kirilenko is and was. Still, there’s a giraffelike quality to the way Porzingis runs the floor — his foot speed is very good for his size, but because of his height, there is an oddness to how it’s all happening. But Porzingis differs from a player like Vesely, for example, in that his major selling points don’t primarily revolve around his incredible athleticism. There are reasons to get excited about Porzingis’s potential, and they start with his shooting ability. He has a gorgeous, fluid, quick motion, and is adept at coming off a screen or shooting off-balance or off the dribble. He’s developed a pretty sweet bank shot from working out with Audie Norris, Sevilla’s assistant coach and a onetime Trail Blazer. There aren’t many 7-footers anywhere who can operate functionally like a shooting wing, getting open looks on flare screens and pin-downs. It’s Porzingis’s most bankable skill, the one that seems most likely to translate immediately in the NBA. He’s like a young Robin trying on Batman’s utility belt — the tools are there, and they’re incredible. They just don’t fit yet, and you can’t be too sure that they ever will. His issues on defense are the same most players his age experience. He bites on pump fakes, he gets caught ball-watching, and he can be a step slow recovering to his man. But there is a chance that, five years down the line, he’ll be doing things that only a handful of NBA big men can do at a high level. This is where you can get inventive with your create-a-player fantasies. He could be either Kevin Love from 3 or Tyson Chandler as the trailer on a fast break. On defense, he could be a roving presence against the pick-and-roll or a rim-protecting sentinel. Doesn’t that kind of sound like Serge Ibaka? Doesn’t that sound like the present and future of the position? But are you comfortable with a future that looks like this? If you’re not, good news: It won’t look like that in five years, or even two years. Like any other bullet point under the “weaknesses” section in a scouting report, “thin, lacks strength” is correctable; unlike most weaknesses, though, it’s one that mitigates itself over time, whether there is a strong emphasis on changing it or not. Bodies can develop rapidly, and Porzingis will be drafted by a franchise with a strength-and-conditioning team that will immediately make his physical growth their top priority. Chandler, Pau Gasol, and Joakim Noah, who all entered the league at around Porzingis’s height and weight, are completely unrecognizable from their teen selves; more recently, Donatas Motiejunas and John Henson have gained significant functional strength since entering the league. Porzingis doesn’t turn 20 until August. Unless he’s the next Alexey Shved, who curiously made a deal with the devil to preserve his 17-year-old body for eternity, the surest thing you can say about Porzingis’s future is that he will grow into his frame. Still, his lack of strength is a legitimate concern. It’s hard to imagine Porzingis becoming a good rebounder in the league, especially in his first season, which will likely see him be tossed around like a rag doll against players who understand the finer points of boxing out. Porzingis averaged 4.6 rebounds this season for Sevilla, but his total rebounding percentage sat at 13.7, which is in the Paul Millsap and Draymond Green range.2 If we were to hypothetically drop his 4.8-rebound average onto a league-average rebounding team in the NBA,3 his total rebounding percentage would drop to 11.1 percent, which is in the range of Motiejunas and Dirk Nowitzki this season. Porzingis is the type of prospect that has historically torn coaching staffs and front offices apart — an extremely young, foreign player who is thrown into the fire to juggle the NBA lifestyle, American culture at large, and a demoralizing sense of placelessness. Coaches are not wired, nor are they paid, to look to the future. Their objective is to win the now. It will take a great deal of communication between the front office and the coaching staff of Porzingis’s future team to figure out the best road map for his development. But unless you’re the Sixers, teams don’t operate in vacuums. The rest of the league changes in an instant and timelines are accelerated. Coaches become impatient and optimism starts to drain out of GMs, too. You wonder how many of the foreign busts of the past were given up on because of communication breakdowns. It’s romantic to believe that basketball is a language unto itself, but it’s worth noting that Porzingis is fluent in English. With the margin for error so slim with high draft picks, maybe eliminating language barrier from the list of roadblocks is enough to add precious grains of sand to the hourglass. More so than maybe any other prospect in the draft, Porzingis requires a team that truly believes in his skill set and will do what it can to foster those abilities within the team concept. Some might balk at the idea of using Dante Exum’s rookie year as a good example for how Porzingis might best be developed, but I think it’s sound. The Jazz targeted key weaknesses for him to tackle head-on and provided an environment where early failure was encouraged. Exum played like a pawn on a chessboard during the season, but was pushed, publicly and privately, to be more. Even then, there are plenty of people who wouldn’t consider Exum’s rookie season — when he played with a near-fatal allergic reaction to the paint — a net positive. It will be frustrating for everyone at times, but that’s the kind of nurturing Porzingis will need. Interestingly, a player in the ballpark of Porzingis’s paltry assist percentage this season is Ryan Anderson, a very good but undynamic stretch 4 who could be considered a reasonable, unsexy comparison for Porzingis. Rebounding totals per game in the ACB hover around the high 20s and 30s — about 10 rebounds below the NBA league average, because of the shorter game time. League average for rebounds per game this season was 43.3.